Dr. Jeffrey W. Flosi is an Associate Professor of Biology and Microbiology in the Department of Natural Sciences at the University of Houston-Downtown (UHD) in Houston, Texas. 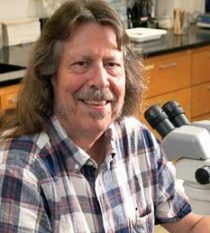 After completing his doctorate, Jeffrey returned to Texas and worked for six years with the Harris County Mosquito Control District as the Chief Entomologist and Laboratory Superintendent, while also teaching part-time at UHD. Since joining UHD as a full-time faculty member in 1987, Jeffrey has taught a variety of courses across the life sciences curriculum including Vertebrate Embryology, Histology, Parasitology, and Virology. As the Principal Investigator for the UHD Medical Entomology Laboratory, Jeffrey investigates the dynamics of mosquito population biology and the transmission of arboviruses such as St. Louis Encephalitis Virus, West Nile Virus and, more recently, Zika Virus. These ongoing studies on the biology and ecology of vector mosquito species are yielding fundamental knowledge of the behavior, breeding preferences, flight range, survival rates, and other basic mosquito characteristics. This laboratory also provides UHD undergraduate students with the opportunity to conduct research on arthropods of medical importance. Jeffrey is a long-standing member of the Texas Mosquito Control Association (TMCA) and he just completed serving as the President for the third time in his tenure as a member of TMCA. Jeffrey has been a board-certified medical and veterinary entomologist for the last 36 years. He also served as the consulting medical entomologist for the Galveston County Health District and the Galveston County Mosquito Control (1987-1997). Jeffrey graduated with a B.S. (Biology) and M.S. (Herpetology) from the University of Texas at El Paso. He received his doctorate in Entomology from Iowa State University in 1980.